Gatto Matto is one of those places that doesn’t seem like much from the outside. I passed it for weeks before I gave it much consideration. However, when I finally ventured in, and I was slightly taken aback. Behind the plain facade was a large outdoor area, full of comfortable chairs and throw pillows. Having grown accustomed to the terrible foam that plagues most outdoor seating, the kind where you can feel the wooden support bars chipping away at your tailbone, the comfortable seating was a revelation. That day became a perfect mix of sunbathing and working, as I typed away on my laptop while sprawled out on a couch. Coffees and soda waters with ice and lime were brought to me and it was hard to imagine myself wanting to be elsewhere. As happy hour grew closer, I called some friends to join me, “Ah, Gatto Matto, I hear that place is nice” they said. “It is”, I replied, “come for drinks.” And so they did and so we sat. As dusk faded into night the walls were illuminated by string lights that were wrapped around the interior, giving a lovely soft lighting and relaxed feel to the space. Then the music started. Seriously, why hadn’t I heard of this place before? Gatto Matto is made up of a primary eating space (a large outside yard filled with comfy furniture) and a small inside formal dining room with tables and cover during bad weather. 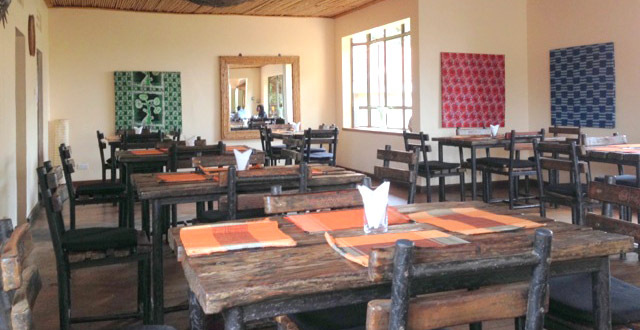 A house on the compound serves as the kitchen, but pulls triple duty, as it also houses a shop where you can buy local crafts, and a spa with a number of services ranging from massages to scrubs and waxing. Being a jack of all trades isn’t particularly new to Gatto Matto. They started more as a pizzeria and slowly expanded their food items and menu. Thai fish cakes, felafel, and pasta carbonara all make up their continental menu. Then of course came the stage. 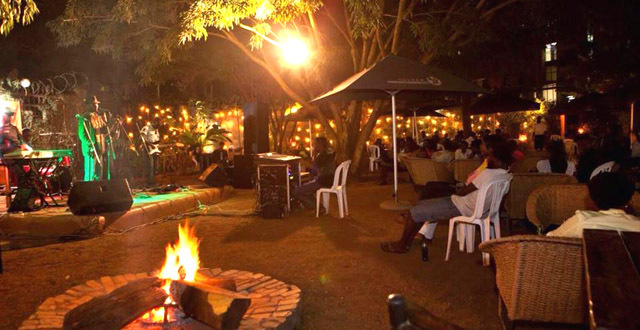 Gatto Matto has one of the best spaces in Kampala for live outdoor music and they have certainly capitalized on this. Every Tuesday live music is on the schedule. While this music tends to run the gamut of local artists who make up Kampala’s thriving music scene, they also have gospel choirs and live shows on certain Saturdays and during special occasions. For the latest on who will be singing at Gatto Matto, it is best to check their Facebook page, which is updated regularly with artists and events being showcased there. However, let it be said that all of this does come with a bit of a price. A quick glance of the menu at Gatto Matto and you notice how few of the items are under 18,000 UGX. 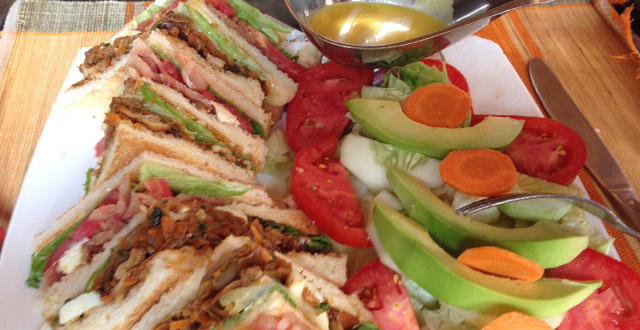 Even the salads tend to range around the 20,000 UGX mark. Other items available at Gatto Matto seem incredibly expensive for what they are. A packet of cigarettes, for instance, ranges near 10,000 UGX and the cost of shisha can also raise some eyebrows. That said, what they do serve tends to have a certain amount of care and thoughtfulness put into it, with a lovely display and delicious food. It should also be mentioned now that their coffee is some of the best in the area, with variations on all popular favorites available. I’d highly recommend to cappuccino and the iced coffees on a hot day. The beautiful setting, and relaxing atmosphere within this walled compound is second to none. Add to that wifi, spa services, live music and you could easily find yourself transitioning from afternoon to evening there. Leaving only when you realize that you have things to do tomorrow, and you’ve got to get to bed. Hi, I’m Lizabeth, a freelance writer whose been stomping around Kampala for the better part of two years. I came here while pursuing a story and decided never to leave. I’m originally from Seattle and have found refuge in both the sun and the culture of Kampalans (plus I still get the rain when I’m feeling homesick).I’m always trying to unearth new and interesting stories about Kampala’s culture and development and am so exited to have an amazing platform to explore the city with. I hope to bring a bit of know-how and a bit of fun to Living in Kampala. Feel free to contact me any time at lizabeth@livinginkampala.com.